TOC wishes all our Muslim readers Selamat Hari Raya Aidil Fitri! Every year in August, in the weeks following National Day, there is an extraordinary spate of self-congratulatory advertisements in the national newspapers on an almost daily basis.The advertisements are placed to congratulate the recipients of National Day awards conferred by the President (see pictures). They are inserted by grassroots organizations (GROs), usually in the name of the local member of parliament (MP) (prominently displayed) and scores and scores of grassroots members. It all sounds rather incestuous since the recipients of the awards themselves are usually members of the same grassroots organization. 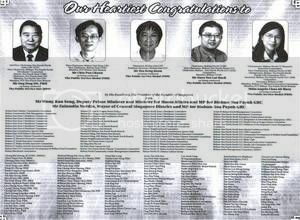 In August 2008 nearly 50 grassroots organizations and MPs ran a half-page advertisement congratulating five recipients for being honoured by the President. The five were members of GROs in their Group Representation Constituency (GRC). In August this year, another constituency ran a half-page advertisement in the name of the local MP, endorsed by well-wishers from local GROs congratulating two awardees who are, predictably, members of their own organizations. One wonders what purpose is served by these public displays of mutual back-slapping? The recipients of the awards are, no doubt, well aware of the good work they are doing and have done, presumably, for many years, in order to merit recognition by the President. The local GROs are also, presumably well acquainted with the awardees, since it stands to reason that they are active in their respective constituencies and are familiar and well known figures. If the purpose is to inform members of the public of the good work these recipients have done, it hardly seems necessary. Those who have benefited from the work done by these individuals are, no doubt, well acquainted with them. The rest, arguably, do not care, especially if they belong to constituencies other than the one to which such individuals belong. Perhaps, the purpose is to frame these laudatory messages and display them in GROs offices for self-congratulatory purposes or maybe in the recipients’ homes for their grandchildren to admire one day. A check with the Straits Times shows that a half-page advertisement on a week-day costs as much as $20,000 per day. Multiply this figure by number of constituencies “honoured” in this manner by the President and multiply it further by several different newspapers and magazines and you arrive at a fairly hefty figure. On an annual basis it is possible that the cumulative amount spent on such messages, congratulatory dinners and the like runs into a substantial sum. I would like to suggest that the millions spent on these “congratulatory” advertisements be used to help needy Singaporeans instead. After all, isn’t the greatest reward of public service, the honour and privilege of having served the nation and Singaporeans? Spending millions of dollars which may have been put to better use, to self-publicise, may in a way undermine the recognition that these National Day awardees so richly deserve.